Two years after our first gull ring reading trip to Morocco together in 2017, Jacob and I went back last January for a 2-week trip. 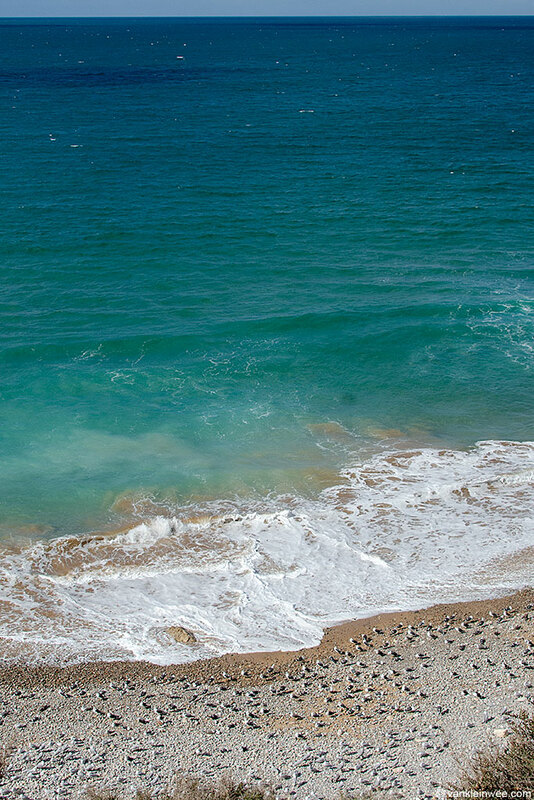 Our plan was to follow the same route by starting at Agadir, staying in the area for a few days before moving up north to eventually end up at El Jadida, and then to travel back to Agadir again. This time though we decided to stay a little longer in El Jadida because the ring reading in 2017 there was so good. It turned out to be a very successful trip. In total, we logged just under 1100 observations of about 800 ringed birds, of 9 different species from 14 different countries. Apart from 9 White Storks and 2 Sandwich Terns, all of them were gulls. (At the time of writing we are still processing our observations so some minor corrections might still have to be applied to these numbers). It is a good problem to have when you don’t know where to start making a list of highlights. Shortly into the trip it would become clear that just having a top 3 would not be enough. 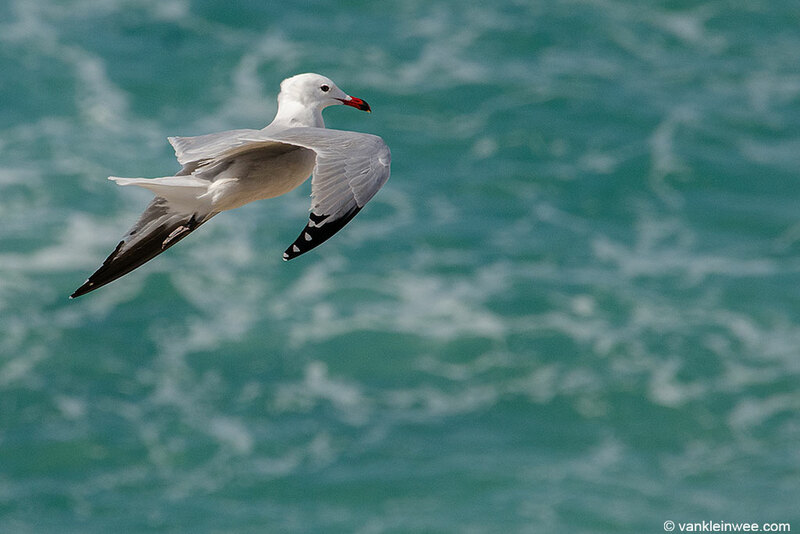 The trip was dominated by Lesser Black-backed Gulls from pretty much every project in Europe, as well as an abundance of Audouin’s Gulls from France, Spain, and Portugal. 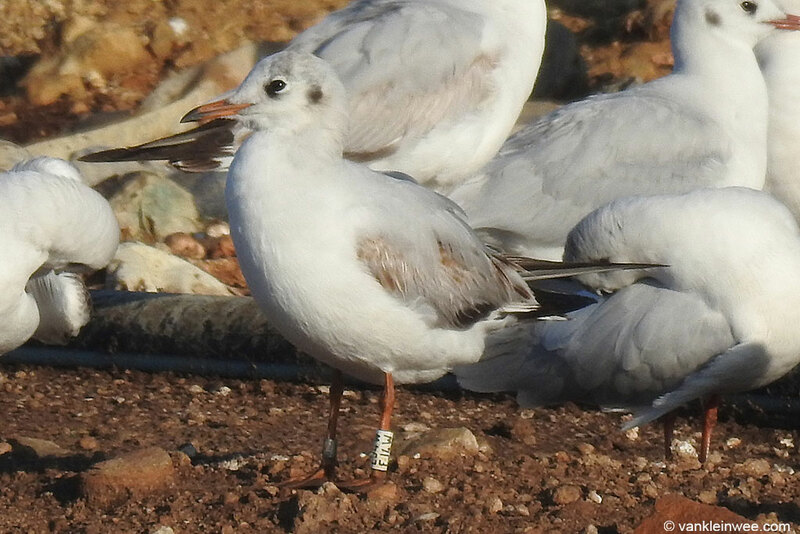 The very first ringed gull that we observed at the landfill of El Jadida turned out to be one of the most exciting ones of the trip: a Dutch Black-headed Gull. 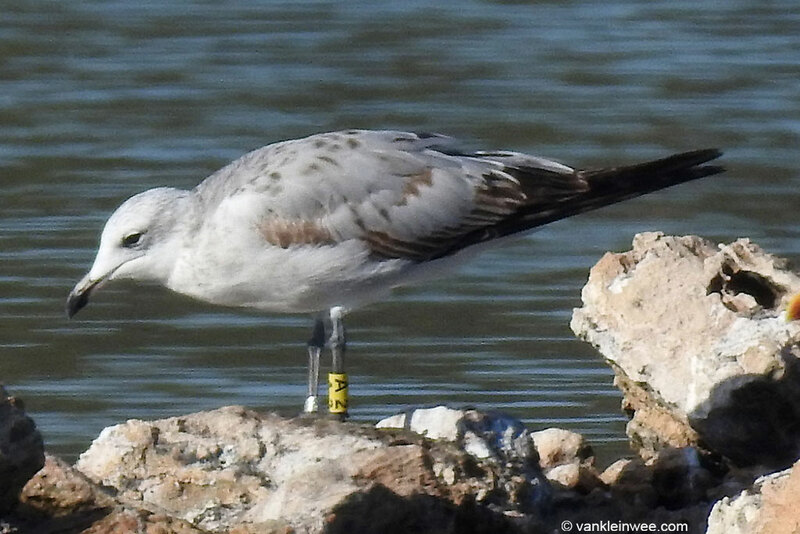 Observations of Dutch Black-headed Gulls in Morocco are rare and this is the first one from this project (Griend) that has been seen south of Gibraltar up till then. Right up there with the Dutch Black-headed Gull for us was coming across an Audouin’s Gull with a colour ring from Croatia. 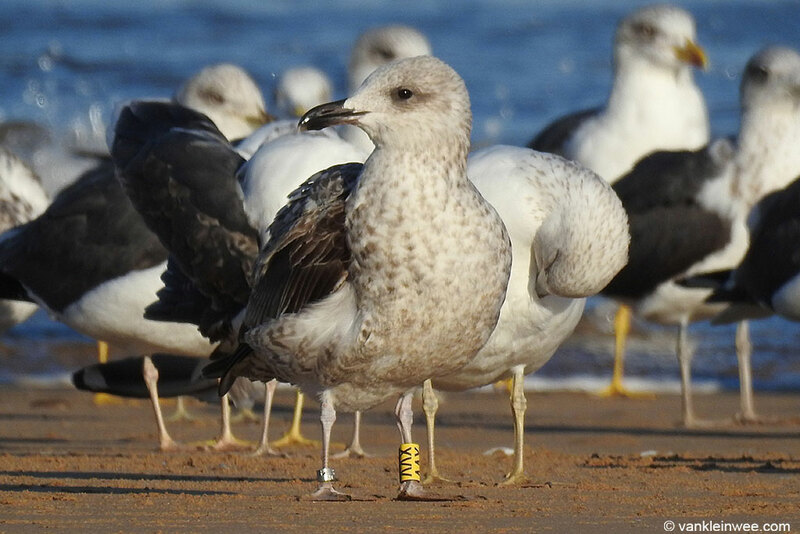 Equally rare to see in Morocco are ringed Yellow-legged Gulls. 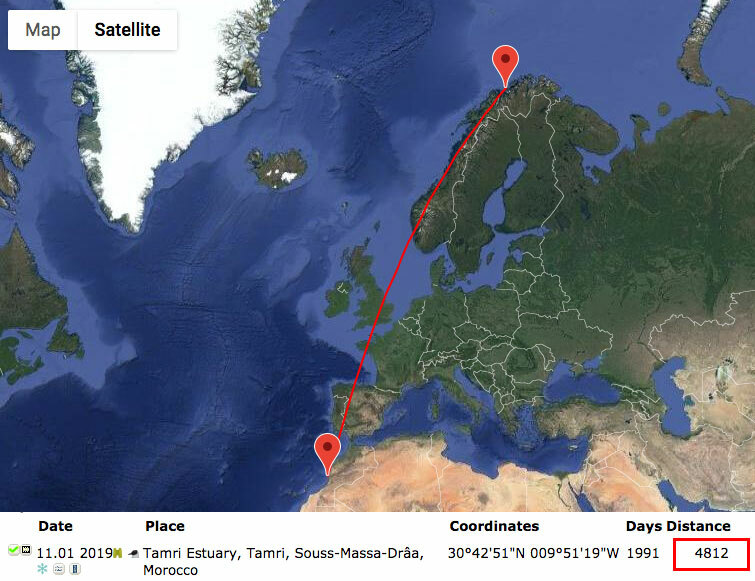 At Tamri (and later at the beach of Agadir) we saw a first-winter that was ringed in Portugal. 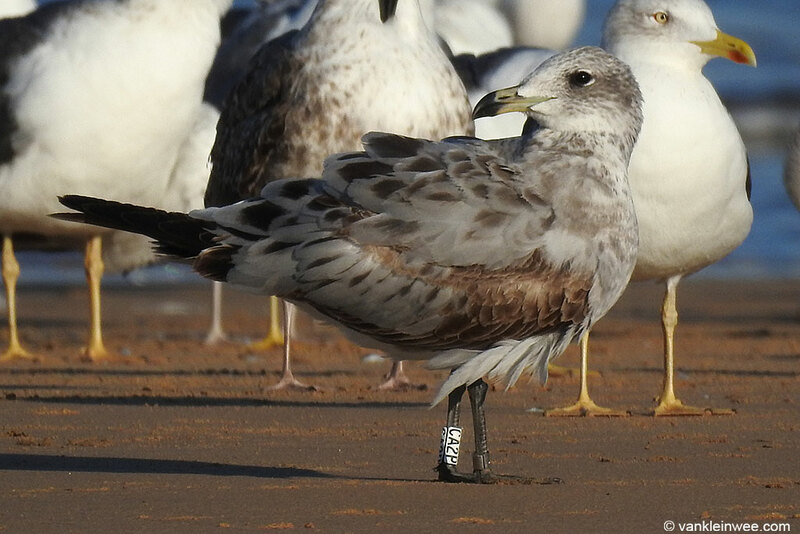 Although we didn’t recognize it in the field, we learned from the ringing details that we had observed a 3rd-calendar year Baltic Gull from Norway. We have even seen it twice (one week apart) but its plumage details (assuming we have seen it because sometimes the groups are so big that you can only see the legs), did not raise any suspicion that we were looking at an odd Lesser Black-backed Gull. Even so, it is nice to have put it on the radar. 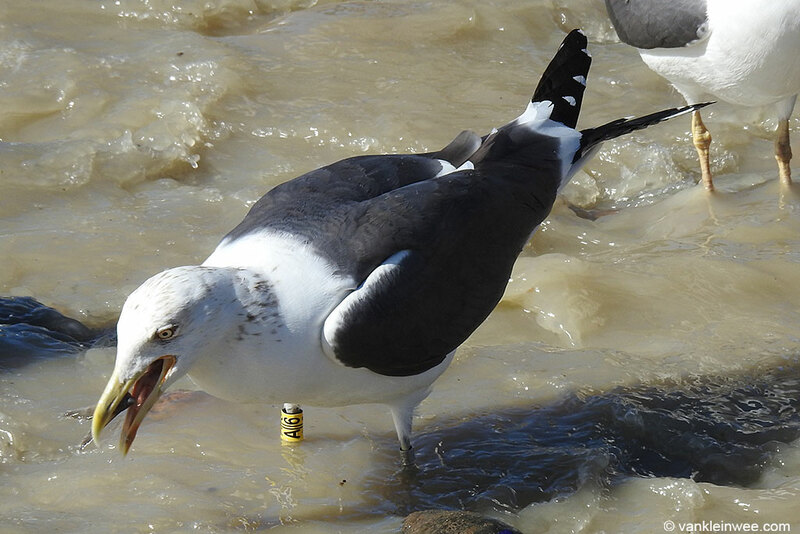 It is only my second ringed Baltic Gull and my first outside of the Netherlands. Not rare as species or project is concerned, but this Lesser Black-backed Gull is worthy of a special mention: it was born in Finmark at the very top of Norway, a distance of almost 5000 kilometers from Tamri where we observed it. 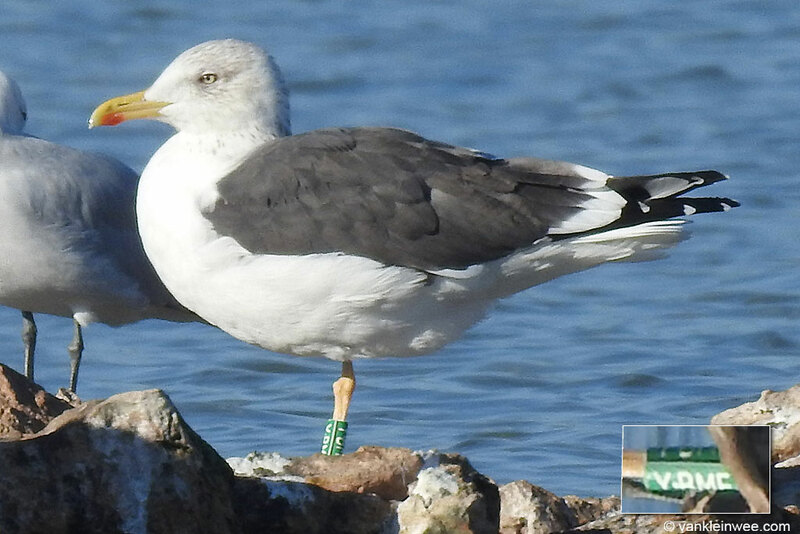 When reading ringed gulls abroad, I’m especially interested in coming across one or more gulls from our ringing project of the IJmuiden Forteiland colony. In total we came across 6 of them, which I’m really pleased about. I have written a full report in another blog post. The price for the gull with the most beautiful plumage goes to first-winter Audouin’s Gulls, such as this one ringed in Spain. Looking back, it’s been a great trip of which we have many fond memories!